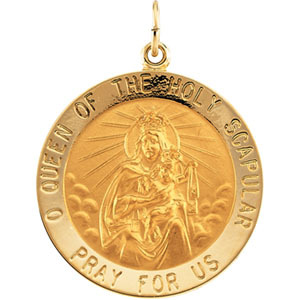 Round scapular medal is made of polished 14kt yellow gold. 25mm diameter medal is the size of a quarter. Inscription: O QUEEN OF THE HOLY SCAPULAR MEDAL PRAY FOR US. On the back of the medal is a picture of the Sacred Heart. Weighs 5.46 grams. Please note: weight is approximate, actual weight may vary.